Dottie always entertains with great style. An evening starts with a variety of appetizers and wine. The dinner features a main dish and several side dishes, and there is always something delicious for dessert. 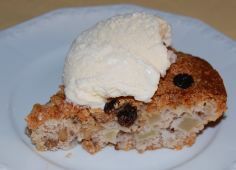 Dottie obtained the recipe for this English apple cake long ago and has perfected it over the years. 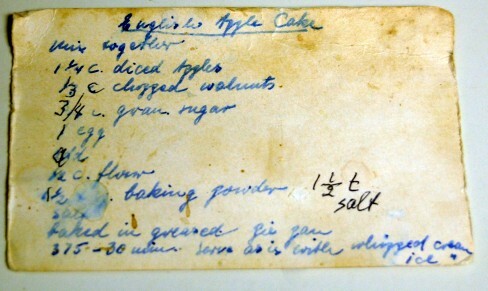 The original 3 by 5 card with the recipe is pictured below. Mix the flour, salt, baking powder, and sugar in a bowl. Combine the apples, walnuts and egg with the dry ingredients to make a batter. 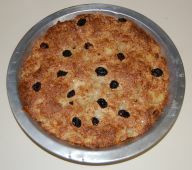 Pour the batter into a greased pie pan and place the raisins on top of the batter. Bake in an oven preheated to 375°F for 30 to 35 minutes until golden brown. Serve with whipped cream or ice cream. This is the recipe that Dottie has used for many years.